Phenylalanine is a crystalline, soluble amino acid that is an essential amino acid found in most protein-rich foods. 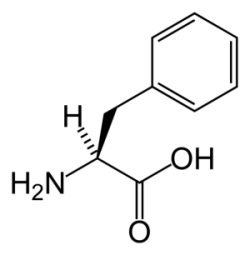 It is one of the twenty common amino acids used by terrestrial living things to form proteins, has the chemical formula HO2CCH(NH2)CH2C6H5. The hereditary condition known as phenylketonuria (PKU) stems from an inability to metabolize phenylalanine normally.